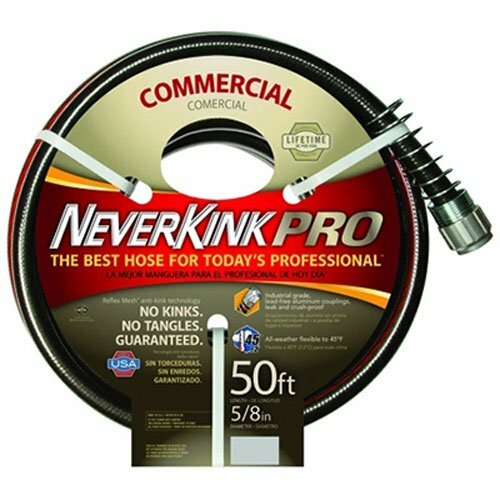 The NeverKink Commercial Duty Pro Garden Hose had 1,659 customer comments and 102 answered questions on Amazon as of this writing. I've read through the feedback and condensed the results into this report. I hope that this helps you when shopping for a garden hose. The NeverKink Commercial Duty Pro Garden Hose is guaranteed not to kink or tangle. It is made of heavy gauge power coil. The Couplings are industrial strengthened, lead-free, while also leak and crush-proof. This hose contains microshield to prevent mold and mildew. It remains flexible down to 45 degrees. This hose is not intended for drinking water. The Neverkink Water Hoses are flexible down to 45 degrees. People who bought and used this hose confirmed that it is indeed flexible. A customer explained, "This hose fulfills its claims! It is more flexible and less bulky than the reddish rubber contractor grade hose from big box stores. Heavy duty, lead-free kink-resistant and durable, the spring guard and couplings attach easily and securely." This hose is middle of the road as far as prices go. The reviews on the prices were very mixed. Some felt it was priced too high for what you get while others thought it was totally worth it. It really doesn't matter since it is what it is and you get to decide if it worth the price or not, and also decide what you are willing to pay. 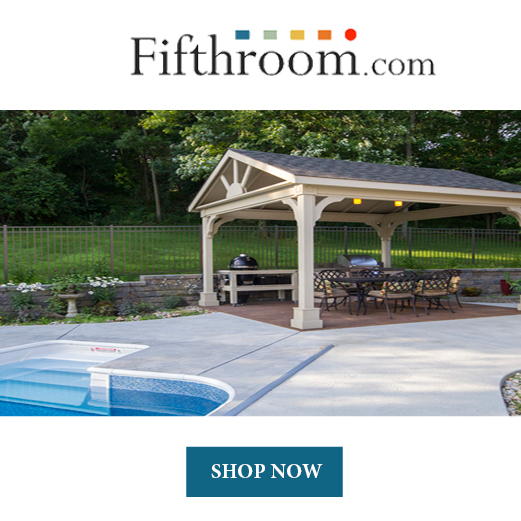 However I will include a quote from each end of the price spectrum in the hopes that it may help you decide if this hose is worth the purchase price. On the positive side, a customer said, "Awesome heavy water hose for the price and I use it multiple times a day on my farm." On the negative side, a different customer said, "Not worth the price, it busted open within two months of buying." This hose did get some reports as being heavy. The description says that it weighs 8 pounds, which is no where near the weight of a heavy duty rubber hose. 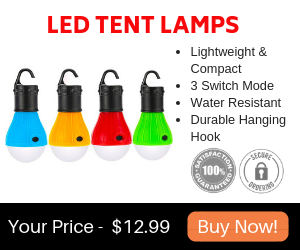 But it also is not going to be as light as the ultralight hoses on the market. Even with the weight being a bit heavy, most people still liked it. One customer had this to say about the weight and other factors about it, "Excellent hose, but be warned, it's a bit heavy. It never kinks. Never. It has an excellent, very heavy-duty faucet connector...Everything about this hose is top-notch, the best I've ever found! When I read the following feedback, about this hose and how it worked and survived the rigors of farm life, I was impressed. Equipment and tools on a farm can take a larger beating than just backyard equipment and tools because it will often have to survive animals stepping on it, extreme temperatures and a wide range of punishment. The customer explained, "Waited to review after a hot summer (100°F), and a very cold (-35°F) winter. I own a small spread with all the typical homestead animals, which is why I needed this hose. The ones at the local hardware store weren't lasting long. I am thoroughly impressed with the strength and durability of this hose. It's been dragged through mud, rocks, pig chicken dog cat goat sheep rabbit poop, withstood extreme temps, and this hose is still in GREAT condition." Unfortunately I came across a lot of customer feedback that said this hose tends to leak. The following is a common complaint, "Seemed like a good quality. But one of them on my dock now leaks like crazy at the female fitting. I checked that the washer was correctly in place and that the seat for it was clean, washer clean and hose fitting was clean. It is leaking where the hose attaches to the fitting." And there were many comments about leaking similar to this one, "Immediately began leaking, right outside the box. Leaks on the male end. The leaking is so severe that it makes this hose nearly unusable. I thought maybe I received a defective product, but many other reviewers note the same. Feel free to take your chances -- but don't be surprised if you have a similar experience." The company is so sure that this hose will not kink, they offer you a refund if it does. From the feedback supplied by customers who bought this hose, it doesn't kink at all. One customer had this to say about kinking, "You can not go wrong with this garden hose. Keep the paper that comes with the hose, if it ever kinks the company will replace it free if you have the receipt too and date of purchase." 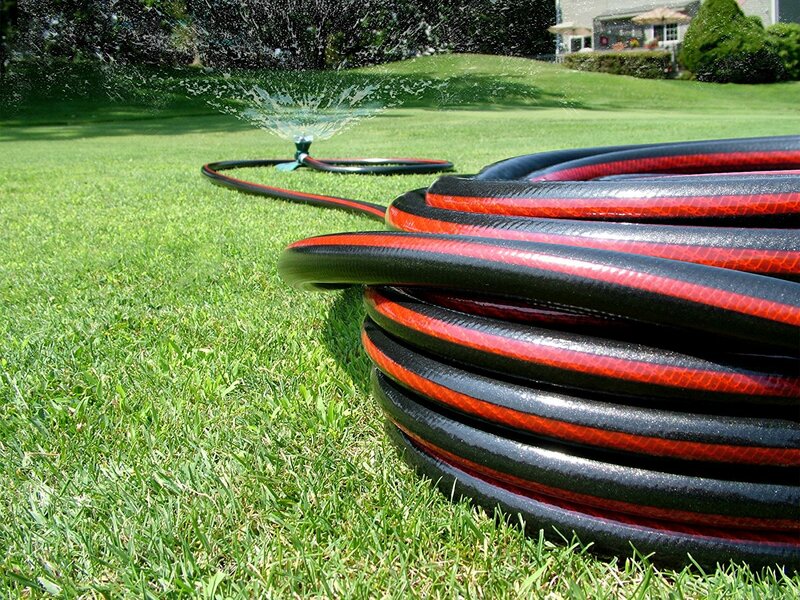 The NeverKink Commercial Duty Pro Garden Hose is a fairly heavy hose that does not kink. However, there were quite a few reports of it leaking on the ends. 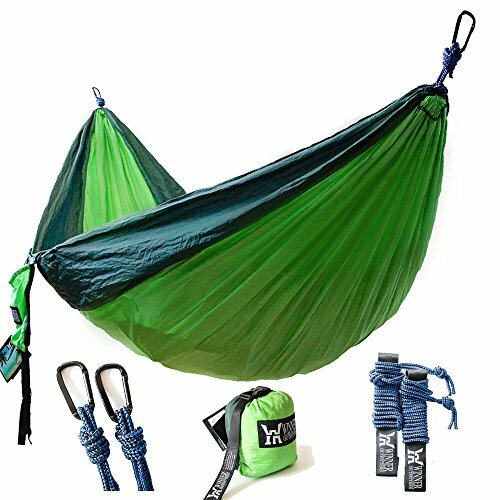 It is very flexible and even retains it's flexible quality down to 45 degrees. It had mixed reviews. Some people said it was great, and one even explained how it performed on his farm after regular daily farm abuse, but there were a large amount of people unfortunately that reported it leaked. Here are some top questions that I found for people considering buying a NeverKink Commercial Duty Pro Garden Hose. Whats the maximum psi it can withstand? The burst rating for this hose is 400 PSI, with a recommended maximum of 375 PSI. What is the inside diameter of this hose? Hose specifications are for the inside diameter, so this hose is 3/4" inside diameter. How big are the connections? The hose has two ¾ inch connections. One male and one female. The female convention is standard for residential hose bibb or wall hydrant.